Ever since humans started building tall things, birds have been pooping on them, including high-voltage power lines. 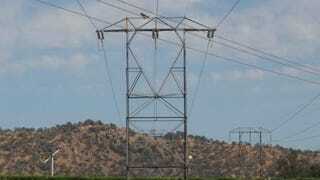 In the 1920s, Southern California power grid was beset by streams and streams of bird poop. In the recent issue of Environmental Humanities, history of science professor Etienne Benson traces the impact of birds on Southern California’s power grid. (Incidentally, Benson also brought us this delightful history of squirrels in U.S. cities.) Electricity works so seamlessly with the flip of switch, he writes, that’s it easy to forget transmission towers have to stand up to dynamic and powerful forces of nature—bird poop included. The power lines that carry electricity from hydroelectric plants in the Sierra Nevada to Los Angeles were constructed in 1913. At 241 miles, they were the longest power lines in the world at the time. Birds would perch and poop on the transmission towers from the beginning, but the problem of “flashovers” didn’t become acute until the 1920s, when Southern California Edison upgraded the power lines to 220,000 volts. Flashovers are basically the result of a short circuit. Electricity leaps from the power line and into a metal transmission tower, setting off a bright blue flash. A flashover could cause voltage drops and even power outages in L.A. In the summer of 1923, these interruptions were happening every two or three days. And so began a battle of wits with the birds. First, the engineers tried to install bird guards that prevented them from perching on their usual spots above a tower’s insulators. But the birds only moved closer, onto the shields that protected the insulators. The towers necessitated more anti-avian architecture, including spikes and a poop-catching steel pan, which together seemed to help. It wasn’t just the towers themselves that had to change though. Benson details how redundancy was added into the electric grid, so that the load could be automatically shifted in the case of a flashover. Something as forgettable as bird poop helped change not only the physical towers but the entire design of the electric grid.